Wednesday: 10.00 a.m. - 18.00 p.m.
Thursday: 10.00 a.m. - 18.00 p.m.
Friday: 10.00 a.m. - 18.00 p.m.
Saturday: 10.00 a.m. - 18.00 p.m.
Sunday: 10.00 a.m. - 18.00 p.m.
One of the most popular tourist destinations in St Petersburg, Catherine Palace was originally constructed by the German architect Johann-Friedrich Braunstein for Catherine I in 1718. The original 2-story building had 16 rooms and the original staircase is still visible today inside the palace. 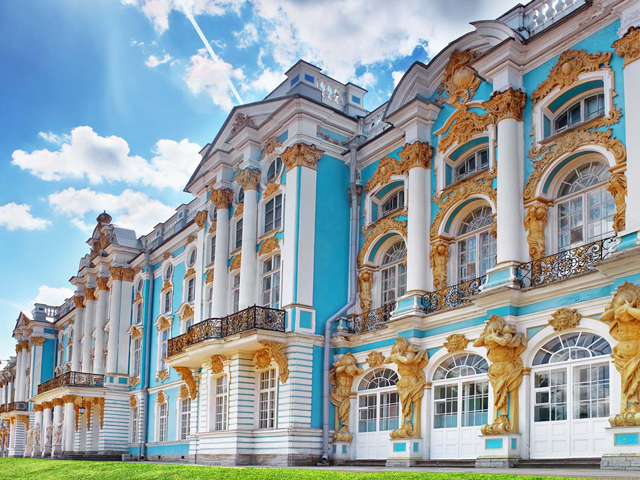 Catherine Palace is situated in the town of Pushkin - a little suburb of St. Petersburg. 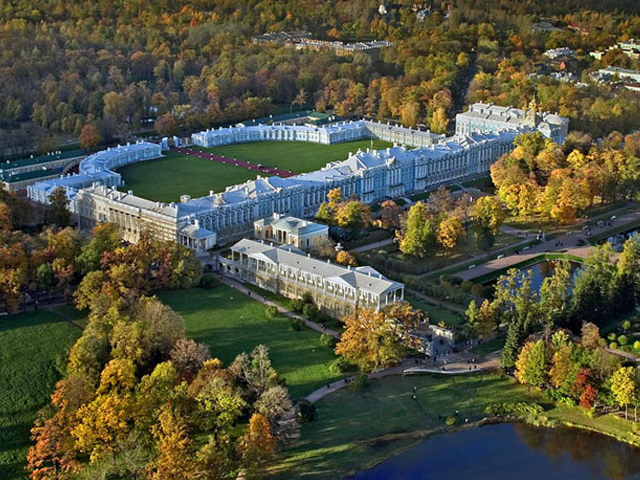 The other name of the place is Tsarskoye Selo, which is translated into English like Tsar's village. The palace was constructed in the 18th century for the Russian Empress Elisabeth I, the daughter of Peter the Great, as her Summer residence. Elisabeth liked luxury more than anyone, and the palace indeed answers her taste. It is constructed in the style of Russian baroque, richly decorated with gilded carvings. 30 kilos of gold was used for the interior decoration only. 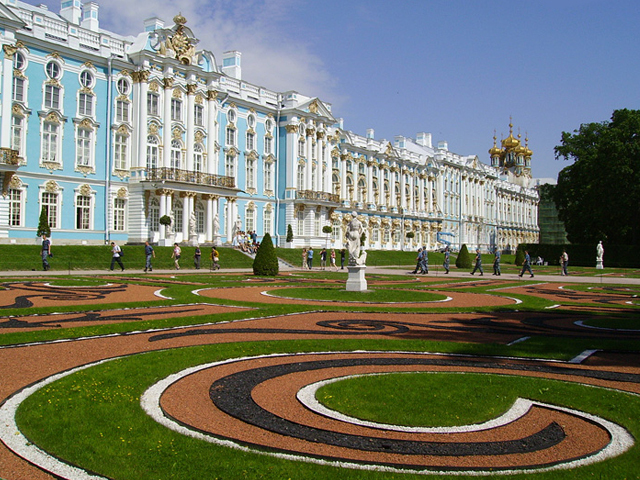 The Amber Room was moved in 1755 to the Winter Palace and then to Catherine Palace. Czarina Elizabeth had her Italian architect, Bartolomeo Rastrelli create a new design from the originals and this required more amber from the Baltic Sea, provided by Frederick II of Prussia. The Amber Room had multiple renovations during the 18th century and in the end contained over 6 tons of amber and a combined 10 years of construction work. During WWII the Amber Room was disguised behind simple wallpaper after attempts to remove it proved too difficult. However, the German army was well prepared to search for such treasure and the Amber Room was removed from Catherine Palace in 1941 by the German army and was last seen in Konigsberg, now Kaliningrad. It was on display at Konigsberg Castle and the director of the museum was overjoyed that the room had been returned to Germany. 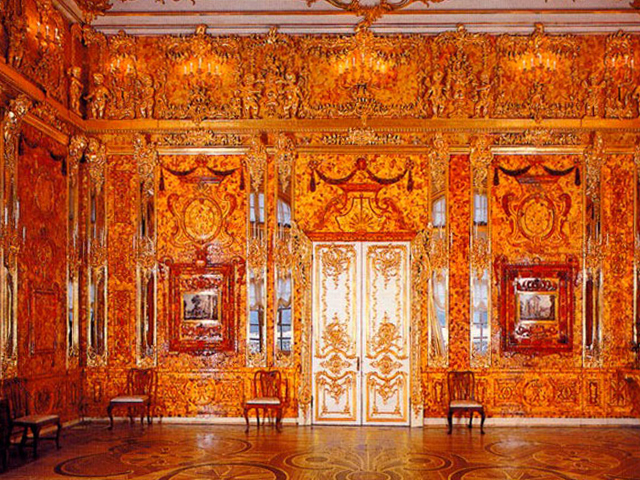 To this day treasure hunters are scouring the land near Kaliningrad hoping to find the mysterious Amber Room. The original Amber Room was reconstructed for the 300-year anniversary of St Petersburg and is a shining treasure to be seen in Catherine Palace once again. The Tsarskoye Selo State Museum, 7 Sadovaya Street, Pushkin, St Petersburg, Russia.